Samsung is holding a Galaxy Event on October 11. There are no details provided but the invite reads '4x fun' implying that this could be related to the announcement of the rumored quad-camera Galaxy phone. Samsung is hosting a Galaxy event on October 11 to announce a new Galaxy device. The invite says '4x fun' but does not reveal anything else. Earlier this month, there were rumors about a quad-camera Galaxy phone in the works thanks to a tweet by known leakster Ice Universe who tweeted, "Camera Camera Camera Camera". 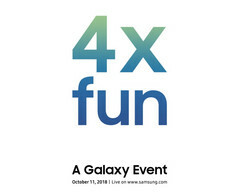 The 4x fun could, therefore, very well mean a quad-camera Galaxy reveal after all. Capture the fun with Samsung as the company celebrates the launch of the new device with A Galaxy Event on October 11, 2018." The news of another Galaxy reveal has caught everyone by surprise as we just recently witnessed the unveiling of the Galaxy Note 9. The Galaxy S10 and the foldable Galaxy X will be seen only next year. However, we can expect Samsung to delve into some additional information about plans for the upcoming foldable Galaxy phone. Samsung's October 11 Galaxy Event will be live streamed on the web at www.samsung.com/galaxy. Expect a few leaks in the coming weeks as we near the event date. We'll keep you posted on all developments so stay tuned.